As you can see, the same interference pattern which was created by a beam of light is produced over time by the sequence of photons. Yet the existence of the interference pattern was explained by Huygens' Principle as due to each slit acting as a coherent source. This implies that each photon passed through both slits, and the resulting phase difference at any point on the screen correlates with the number of photons which eventually hit there: no photons hit where the interference is destructive, and many photons hit where the interference is constructive. Hence we conclude that traveling quanta of the electromagnetic field behave as traveling waves do. 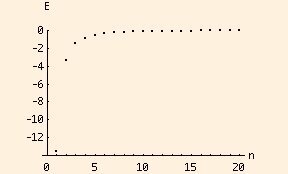 λ = h / m v.
This relationship gives us our first clue to the length scale by which particles are measured. Setting the scale using the speed of light for the velocity we find the Compton wavelength of an electron to be about 2.42 * 10-12 m, while for a proton it is 1.32 * 10-15 m. These represent minimum sizes, since velocities are always less than the speed of light. 2 π r = n h / m v.
the angular momentum of the electron relative to the nucleus is quantized. This is known as the Bohr quantization condition. ms, the spin quantum number, equal to +1/2 or -1/2. The images below are plots of the amplitude of the electron wave function for the Hydrogen atom. Because the atom is three dimensional, we have shown the intersection of the electron with the x-z plane. Each plot is labeled by the quantum numbers n, l and m; the spin quantum number does not affect the appearance of the wave function. Note the nodes (black rings) in the amplitude for n = 2 and n = 3. Just as in the case of the one dimensional standing wave with fixed boundary conditions at both ends, these waves have n - 1 nodes. These electrons are called 1s, 2s and 3s, respectively, by chemists. These are all 2p electrons. The following applet will show you a full three dimensional plot of the wave function for one or two electrons in a Hydrogen atom (for a single electron, set "n2" to zero). Push the "replot" button to redraw the plot. The scroll bars allow you to change n, l and m for each electron. Electron 1's wave function is plotted in magenta, and electron 2's wave function is plotted in cyan. The two colors add to blue or white where the wave functions overlap. To change the perspective, drag the mouse across the window; to zoom, turn the scroll wheel. This applet comes with a caveat: when plotting the wave function for two electrons, the mutual interaction of the electrons has been ignored. This is an unfortunate necessity caused by the complexity of the equations of quantum mechanics: the applet only knows solutions in closed form for individual electrons in a single-electron atom. But the plots still exhibit the essential qualities of the electron wave functions that interest us. Please be patient: each plot requires the evaluation of each wave function at over 3.5 million points! The "Replot" button will be labeled with ellipsis while the evaluation process is taking place. which is about half an Angstrom. This value can only depend on the electrical attraction between the electron and the nucleus, the mass of the electron, and Planck's Constant, and is derived from dimensional considerations (see the problem below). E0 = 2.18 * 10-18 J. This value can be derived from the sum of the kinetic energy (through the Bohr quantization condition) and the electrical potential energy of the electron. In the limit of n approaching infinity, the energy spectrum (set of levels) becomes continuous. This is called the classical limit, since classical energies are not quantized but can be any real number. A basic tenet of the quantum theory is that as n approaches infinity, the equations (ie., for energy) should become equivalent to their classical (macroscopic) counterparts. This idea is called the correspondence principle. tPlanck = 1.35 * 10-43 s.
The Planck mass and energy are not minimums; rather, they are the mass and energy of a black hole whose size is of the order of the Planck length. A black hole is an object which has collapsed to such a massive density that even light is not fast enough to escape its gravitational attraction. Because these values involve Newton's Constant, they are relevant to Quantum Gravity: the still sought-after theory which unites quantum theory with General Relativity. Now you have an opportunity to construct expressions for the various scales we have discussed in this section. Of particular use in some of these problems are the ratios G/c2 and e2/ε. Work out their units to figure out why they are so useful! Notice the relationships between the Planck mass and energy, and between the Planck energy and time. These are useful in constructing energy and time scales for any particle. For multielectron atoms, it is almost always too complicated to find exact wave function solutions; this has only been done for Hydrogen and Helium. Instead, we must resort to approximations and numerical computer analyses. The Bohr model holds for one electron atoms; for larger atoms, successively higher level electrons "see" successively lower values of Z due to charge screening of the nucleus by the inner electrons. The n = 1 electrons see the actual Z, while the outermost electron of a neutral atom sees Z = 1 (assuming n is large and l is zero). Each of the (n, l) pairs is called an "electron shell". In fact, the energies depend not only on n and l, but to a much smaller degree on m and ms as well, which means the above list is only approximately correct. The Periodic Table is based on the observation that an element's chemical properties depend on the number of electrons in its outer (valence) shell. Without repeating quantum numbers, we can "populate" the allowable energy states using the order from the table above, noting that for any given values of n and l, there can only be 2 * 2l +1 pairs of electrons, corresponding to the allowable values of m and ms. For each of the pairs in the table above, you can count to see how many electrons are in the outer unfilled shell. Elements with the same number go in the same column of the Periodic Table. When the shell is full, the element goes in the (rightmost) "inert" column, since it does not easily react with a filled valence shell. The next element goes into the leftmost column (for those elements with only one electron in their outer shell). Note that the energy levels used in constructing the Periodic Table are ground states (states of minimum energy). With sufficient energy (see the next section), any electron can "jump" to any level. So can you never get out of a black hole no matter what you do? To answer this question, we need to understand two new ideas: light cones and event horizons. The future light cone is the collection of all the places that particle might ever be at any given time in its future. The surface of the cone is where it could be if it travels at the speed of light, and the interior of the cone is where it could be if it travels more slowly. Therefore photons are destined to stay on the surface of their light cones and massive particles are destined to stay in the interior of their light cones. The past light cone is the collection of all the places that could have influenced that particle at any given time in the past. So your future light cone contains all of your possible future paths, and your past light cone contains all that you could know from the past. A black hole is created by an object which has undergone gravitational collapse to an infinitesimal size (which means its density approaches infinity!). The laws of General Relativity cannot predict the final state of the collapsed object; it simply does not produce meaningful answers at those length scales. But it does predict the existence of a boundary around the collapsed object, the event horizon, which is an imaginary surface that defines the black hole. As anything (even light) approaches the event horizon, the gravitational attraction toward the collapsed object becomes so great that its future light cone is tipped further and further toward the object. As it crosses the event horizon, one direction on its future light cone is parallel to the horizon, and the rest is pointing into the black hole. So their is NO escape once you cross the event horizon! Let's assume for a moment that you are falling into a black hole feet first. What you experience until you cross the horizon depends on how much mass the collapsed object has. Larger objects have horizons which are so far away from the object that the gravitational force is essentially constant over the length of your body. Smaller objects have horizons which are much nearer, so that the gravitational pull on your feet is much larger than the pull on your head, resulting in significant (and perhaps fatal!) stretching. But even if you survive to reach the horizon, regardless of the mass of the collapsed object, it's all over. The future light cone of your feet is pointing into the center of the black hole, so no nerve impulses can reach your head from there. When your heart crosses, no blood can flow from it to your head. And when your head crosses the horizon, the parts of your brain cannot communicate with each other and your consciousness ceases. You may have heard that black holes can evaporate. While this phenomenon has not been experimentally observed, quantum mechanics tells us that black holes can emit Hawking Radiation (named after physicist Stephen Hawking, who first came up with this idea). Hawking Radiation is a thermal emission which causes the collapsed object to lose mass. Eventually, the object and everything it has swallowed disappears. But that doesn't help you if you've crossed the horizon: all of your mass has been converted into energy and radiated off, but that thermal radiation contains none of the structure that defined you. There is another more important consequence of the one-way nature of the event horizon: since nothing (except perhaps Hawking Radiation) can leave the interior of the black hole, no information about it can ever be communicated to the outside. The interiors of black holes are not subject to experiment! Therefore, in a very real sense, the interiors of black hole event horizons, including the ultimate fates of the collapsed object and anything else which falls inside, lie outside the realm of science. In the next section we see how the transitions of electrons between energy levels is the basis for all that we see. ©2008, Kenneth R. Koehler. All Rights Reserved. This document may be freely reproduced provided that this copyright notice is included.